It's always interesting to see who might have been cast in some of the iconic roles from your favorite TV shows. 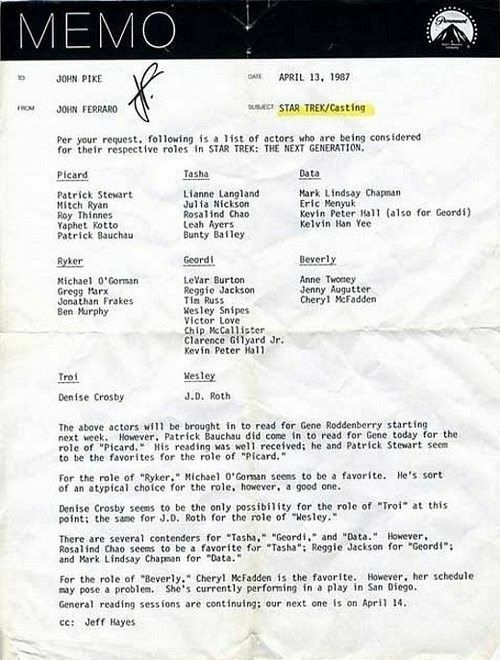 As you can see from this old casting memo for Star Trek: The Next Generation, we could have ended up with a very different crew. To think that Yaphett Kotto might have been Picard or that Denise Crosby was actually considered the "only" person to play Counselor Troi (she made a much better Tasha). Maybe if Wesley Snipes had gotten the role of Geordi, he might have found someone to manage his tax situation better and, with his busy schedule, we may have been spared the Blade movie sequels.